Adult male, wild-collected specimen; neutral mood. Wild-collected adult female; neutral mood. 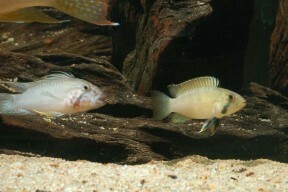 Adult oair, female to right; both fish beginning to display threat behaviour. ...a feature also exemplified here. Known only from minor jungle tributaries, presumably of the Solimões river‘s north bank, close to the city of Leticia, Amazonas department, Colombia. The city lies in the “Tres Fronteras” area at the point where the borders of Colombia, Brazil and Peru meet. No firm details are available but the closely-related A. barlowi is collected from small forest streams where it shows a preference for clear, relatively cool, fast-flowing stretches containing very clear water with acidic to neutral pH. At one particular such habitat measuring around 1 m wide water depth was around 30 cm and the substrate was composed of white sand with no rocks or submerged vegetation. The water temperature was almost 84.2°F/29°C, pH 4.8 and conductivity 26 µ/cm. 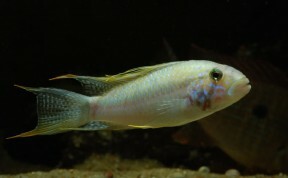 Base dimensions of 60 ∗ 30 cm or more are just about acceptable for a single pair, though this species seems to fare better in larger aquaria. The addition of dried leaf litter (beech, oak or Ketapang almond leaves are all suitable) would further emphasise the natural feel and with it bring the growth of beneficial microbe colonies as decomposition occurs. These can provide a valuable secondary food source for fry, whilst most populations will appreciate the tannins and other chemicals released by the decaying leaves. Leaves can be left in the tank to break down fully or removed and replaced every few weeks. Fairly dim lighting is recommended and plant species from genera such as Microsorum, Taxiphyllum, Cryptocoryne and Anubias are best since they will grow under such conditions. A few patches of floating vegetation to diffuse the light even further may also prove effective. Water changes of 20-30% per week should be considered mandatory. Seems to be primarily carnivorous and likely to feed mostly on benthic invertebrates in nature. In the aquarium live and frozen foods such as Artemia, Daphnia and chironomid larvae (bloodworm) should be offered regularly although most specimens will also learn to accept dried alternatives with pelleted products generally preferred to flake. 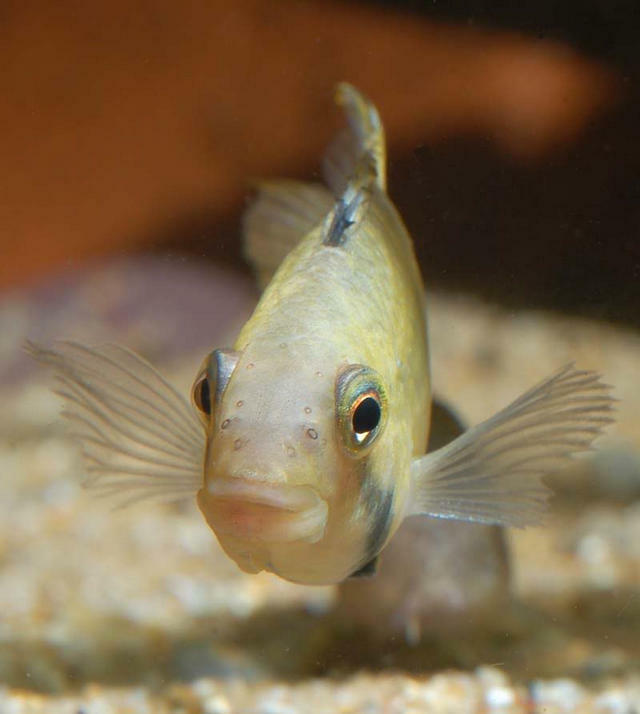 Best maintained alone or with small ‘dither’ fishes such as Nannostomus spp., and ideally should not be mixed with other Apistogramma. Relative to some other members of the genus it’s apparently quite mildly-disposed towards conspecifics. Facultative, biparental, larviphorous mouthbrooder. 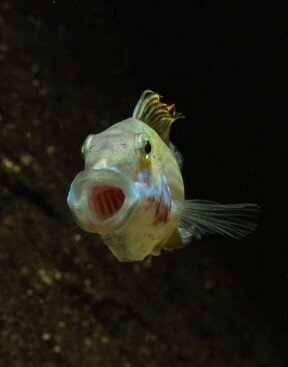 A. barlowi is the only other member of the genus known to employ such behaviour which is also remarkable for its plasticity. Either a single or both parents may be involved in the mouthbrooding process or the eggs and fry may instead be maintained in a shallow pit excavated in the substrate throughout broodcare. 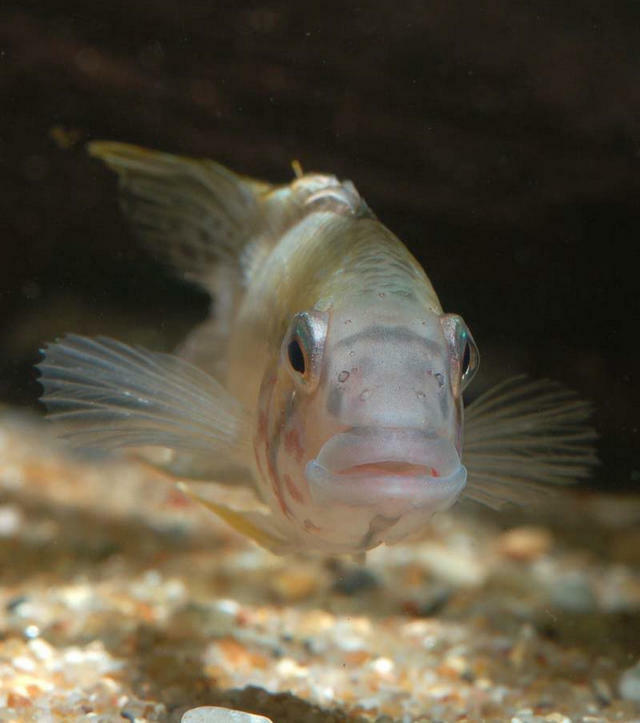 Selection of a precise strategy may well be influenced by environmental conditions with laboratory observations of A. barlowi recording a greater percentage of females than males mouthbrooding over substrates of fine sand, while under strong water flow it was exclusively males that did so. Norwegian aquarist Tom Christoffersen maintained one pair without tankmates and another alongside a group of Nannostomus marginatus and pair of Copella vilmae with other conditions basically identical. In the former pair the female was solely responsible for mouthbrooding, while in the latter no such behaviour was observed and the eggs were deposited into a shallow depression in the substrate where they remained until free-swimming. 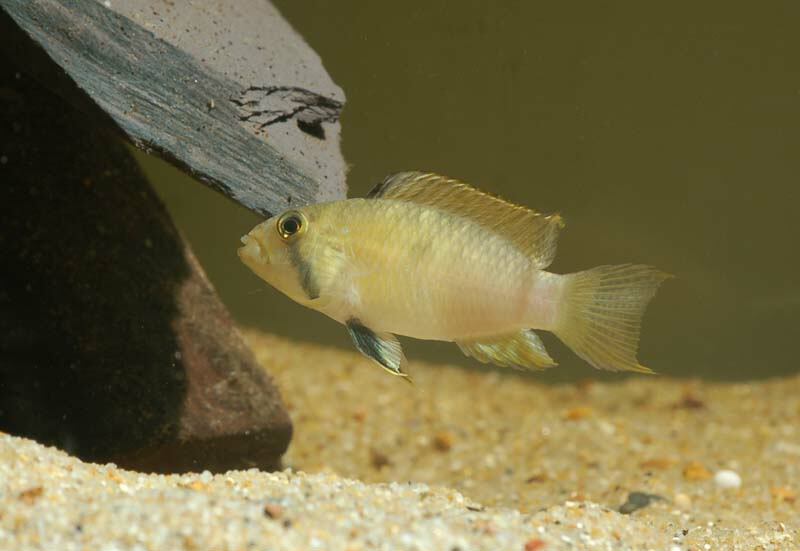 Additional observations suggest that substrate size also plays a part with the adults often picking up the eggs immediately over fine sand whereas when gravel is used they tend do so after several days or not at all. This undescribed species was first collected and subsequently appeared in the aquarium hobby during 2008. It was exported again in late 2009 and early 2010 under the names A. sp. ‘Jutai’ and A. sp. ‘diamond face’, and said to have been collected in the Río Jutai, Amazonas state, Brazil. The Jutai is a south bank tributary of the Solimões but lies several hundred kilometres downstream of Leticia so this information, from a purportedly trustworthy source, initially caused confusion. The exporter later let it be known that the fish were in fact collected near Leticia and they appear conspecific with the fish from 2008. It’s also appeared on trade lists as A. sp. ‘Leticia’. Member species have also been organised into a series of species lineages, complexes and groups by authors in order to better separate them. Such lists have been augmented by fish that have appeared in the aquarium trade and are in a state of near-constant flux. For example the A. barlowi complex, of which A. sp. ‘Kelleri’ is a member, is contained within the A. atahualpa group within the larger A. trifasciata lineage. Apistogramma barlowi sp. n.: description of a new facultative mouth-breeding cichlid species (Teleostei: Perciformes: Geophaginae) from northern Peru.